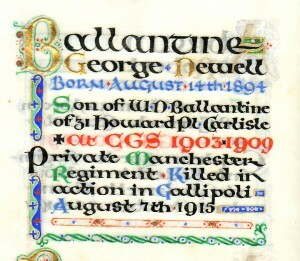 George Newell Ballantine was one of five children born to William Newell Ballantine and Minnie (nee Carr). His three brothers died aged two, three and nine years old, leaving his parents with George and his sister Minnie. She became a teacher and died unmarried aged nearly 80. The Ballantine and Carr families lived near each other at Higher Bebington, Cheshire in 1881, William and Minnie married in 1884. George’s father had started his working life as a painter and decorator and then became a commercial traveller selling paint. His father’s family had come from London and his grandfather had been a decorator too. His paternal grandmother was Charlotte Rebecca Newell, born in Ireland. His mother came from a large family which had finally settled in Cheshire, although his mother was born in Liverpool and her parents were from Yorkshire and Edinburgh. George’s maternal grandfather was the most famous member of the family. He was a copperplate engraver by trade, but his passion was bee keeping and he was invited by Thomas William Cowan to go to London and help set up and edit The Beekeeper’s Journal. In 1890 he invented a type of beehive which is known as the WBC. He wrote articles on bees for the 1911 edition of the Encyclopaedia Britannnica but died before they were published. At the grammar school George was a day student 1903-09; he must have had one of the shortest walks to school as the family lived on Howard Place! He won the French and Latin Prizes in 1908. Territorial Force was formed in 1908 and George was recruit number 1491 which suggests that he enlisted prior to war breaking out,he was probably a “Saturday Afternoon Soldier”. The regiment was sent to Egypt in September 1914 where a great deal of basic training took place. Allied forces first landed on the Gallipoli Peninsula in April 1915. The Manchester Regiment moved to Gallipoli in May. In August the Battle of Krithia Vineyard took place to divert attention from a planned landing at Suvla. Between August 7 and 9 there was a series of attacks with little ground gained. There were at least 4000 British casualties, and probably double that number of Ottoman casualties. On August 7 the regiment’s war diary notes that 140 men were dead, wounded or missing. Later records say that a minimum of seventy-five men were killed including George. His body was never found and he is commemorated on the Helles Memorial. He died a week before his twenty-first birthday. After leaving school George became a manufacturing chemist’s assistant, but by 1911 he was working as an insurance clerk.